What Men Want is a reimagining of the 2000 film What Women Want starring Mel Gibson. 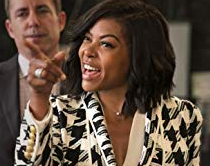 Set around the NBA draft, Taraji P. Henson is great as the extremely successful, personally detached, business driven sports agent, like Miranda Priestly in The Devil Wears Prada, but in a man’s world, so she gets less respect. out to prove her worth and get the promotion she deserves. What Men Want is Taraji’s departure from the heavily dramatic roles we’ve come to expect from her and gives her the opportunity to carry a comedy. She does a pretty good job. She gets some help from Tracy Morgan, who is just a goof, but this is Taraji’s movie. She is in control, and she looks great doing it. Taraji credits twitter with helping her get the role; “Most people didn’t recognize my funny until twitter.” With What Men Want, Taraji shows that she is a well-rounded actress who can bring laughs, tears or strike fear in her audience. The story we see in What Men Want is one we’ve seen before- a person who is out to get ahead disregards the feelings of friends, family and potential lovers. Our protagonists uses a “by any means necessary” approach to achieve their goal, only to realize that they’ve alienated themselves and that the unbearable loneliness at the top can only be reconciled via a long expository monologue of an apology.